NRZ (non-return-to-zero) line code is a binary code in which 1s are represented by one significant condition (usually a positive voltage) and 0s are represented by some other significant condition (usually a negative voltage), with no other neutral or rest condition. NRZ Configurable protocol decoder enables grouping bits using various combinations of bit rate, polarity, idle condition, time out and more to decipherable messages. It allows decode of various protocols developed using NRZ encoding scheme. The Configurable Manchester and NRZ Decode options enable flexible, user-definable protocol decoding of serial buses built with these encoding schemes from 10 b/s to 10 Gb/s. The physical layer specs like bit rate, idle state and polarity can be easily defined enabling quick decoding of every bit transmitted on the bus. 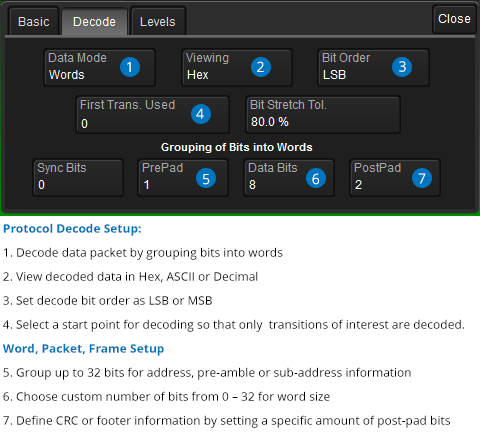 Higher level decode can be done by configuring bits to words and then words to packets. Define the number of sync bits, header or pre-amble bits, data bits and footer or CRC bits to build a custom protocol decoder for a proprietary bus or decode Manchester or NRZ based industry standard buses like PSI5, DALI, and proprietary NRZ protocols. The configurable Manchester and NRZ decode option is available on a wide range of oscilloscope models from 200 MHz to 65 GHz. Manchester and NRZ encoding schemes both use a variety of methods for making bits in to words, words in to packets and packets in to protocols. The configurable Manchester and NRZ decode capabilities are designed to provide the flexibility needed to display decoded protocol information built on these encoding schemes. This flexibility enables quick decoding of protocols built on industry standards or custom, proprietary protocols. Color-coded overlays display the protocol decode directly on top of the physical layer waveform for an easy-to-understand visual display. The decode information condenses or expands depending on the timebase or zoom setting, simplifying both routine verification and complex troubleshooting. Quickly search through long captures of decoded Manchester or NRZ encoded buses for specific details such as Data, Sync, Interframe Gap or Status. Turn the oscilloscope into a protocol analyzer with the table display of protocol information. Configure the table to display information, such as, sync, pre & post data, and export table data to an Excel file.